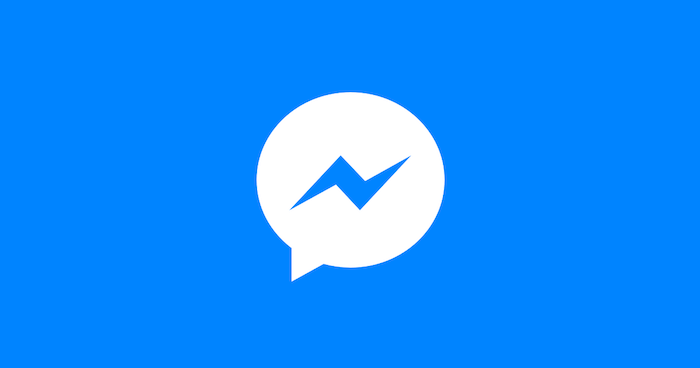 This is a comprehensive guide to Facebook Messenger Marketing using chatbots in 2019. We know that the idea of using a chatbot can be a little intimidating, especially for startups and small businesses. But the truth is that chatbots can improve marketing and make marketers’ lives easier. To create this guide, we partnered with Larry Kim, the CEO of MobileMonkey, a popular Facebook Messenger Marketing platform used by millions of users worldwide. If you want to supercharge your marketing and accelerate growth and revenue, you’ll love this guide. Here’s a table of contents to help you quickly navigate different sections of this guide – or feel free to scroll. How do Facebook Messenger bots differ from other bots? Why are smart marketers using Messenger chatbots? How are smart businesses using Facebook Messenger bots? How can you create your Facebook Messenger chatbot? How can you promote your Facebook Messenger chatbot? Add a Facebook Messenger button on your website or Facebook page. Use paid ads on Facebook Messenger to build your subscriber list. Link your Facebook Messenger chatbot from email signatures. Add your chatbot to Facebook’s discovery tab. How can you use your Messenger chatbot effectively? 1. Subscription Messaging: what it is, and how to get it. Facebook Messenger is a popular messaging app and platform. 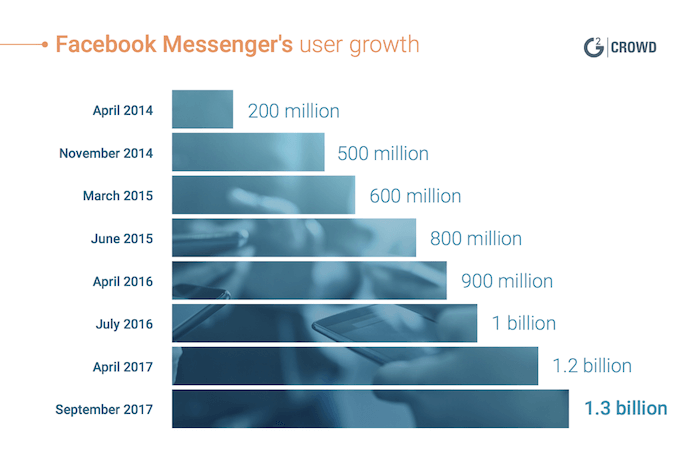 Over 1.3 billion people use Facebook Messenger and as you can see in the chart below from G2 Crowd, Messenger’s user growth has been consistently strong. Chatbots are programmed to understand basic questions, provide answers, and execute various tasks. Watch the following short video for a quick overview of bots. Chatbots are growing in importance. According to Gartner, by 2020, 85% of our engagement with businesses will be done without interacting with another human. Instead, we’ll be using self-service options and chatbots. 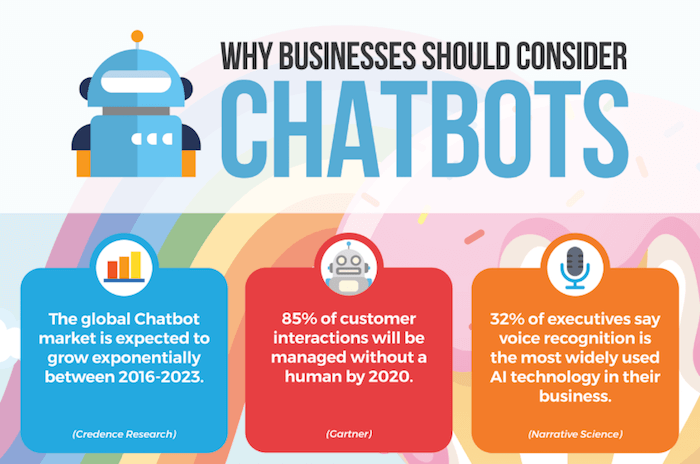 Additionally, according to an Oracle survey, 80% of businesses said they currently use or are planning to use chatbots by 2020. On the consumer side, over 59% of millennials and 60% of Gen Xers in the U.S. have interacted with chatbots. And according to a Facebook survey, more than half (53%) of customers say they’re more likely to shop with a business that they can connect with via chat. A Facebook Messenger chatbot or bot is exclusively built for the Facebook Messenger platform. There are over 300,000 active chatbots on Facebook Messenger. Companies like Drift and Intercom offer chatbots to help companies automate and improve lead generation, help with email marketing, and other things. If you want to learn more about chatbots generally, read Drift’s The 2018 State of Chatbots Report: How Chatbots Are Reshaping Online Experiences. You Get All the Contact Information – The conversations aren’t anonymous. Facebook sends you the identity of people who are messaging your website, including all contact information and even a profile photo. On other chat platforms, if the user closes the browser, the marketers will have no idea who they were talking to, which is frustrating. You Can Send Them Push Notifications – Anyone who messages your page is opted into messaging, so you can send them follow-ups or reminder drip campaigns, which is amazing. You Get Their Facebook ID: These tend to last forever, where as business emails expire on average 4% / month due to people changing jobs, etc. You Can Remarket to Them – Using Facebook ads. But there are a lot of other things Drift and Intercom do, like email marketing, and other super expensive, fancy enterprise stuff. A number of companies, including MobileMonkey, ManyChat, and Chatfuel offer tools that help you build Facebook Messenger bots. Companies like Chatfuel target bigger, more enterprise-level customers (and as a result, are more complex to use and cost more). Others like ManyChat offer limited free plans and the paid plans can get pricey very quickly. MobileMonkey offers the best of both worlds: powerful free and inexpensive paid plans with easy to use tools for small businesses and startups (and plenty of powerful tools for enterprise customers). Marketers want to reach more prospects, generate more leads, and improve conversions. This was historically easy and cheap to do on Facebook, but in the past several years, Facebook’s organic reach has eroded while ad costs have increased. As a result, many marketers have moved their campaigns away from Facebook to other social platforms. But there’s a way to regain the historically strong reach and engagement on Facebook while reducing your costs: Facebook Messenger chatbots. 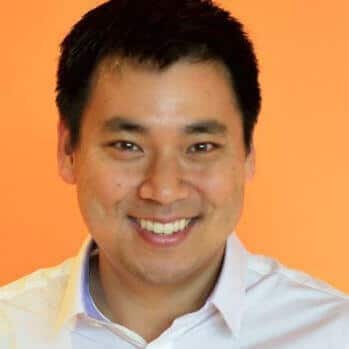 Larry Kim is not a stranger to digital marketing. Before founding MobileMonkey, Kim founded WordStream, the world’s leading PPC (pay-per-click) marketing platform managing over a billion dollars of annualized ad spend for tens of thousands of businesses. There are more daily active users of popular messaging applications than social media applications, yet less than 1% of companies are doing chat marketing. I thought that was crazy, so MobileMonkey was born. That’s why smart marketers are increasingly using chatbots, and especially Messenger chatbots, as part of their marketing strategy. Messenger chatbots can help you regain reach and engagement with Facebook users. Facebook Messenger messages reach far more users than organic posts. In fact, while organic Facebook posts reach an average of 1 to 2% of Page fans, the average open rates for Facebook Messenger messages is 50-80%, with a 20% average click rate. 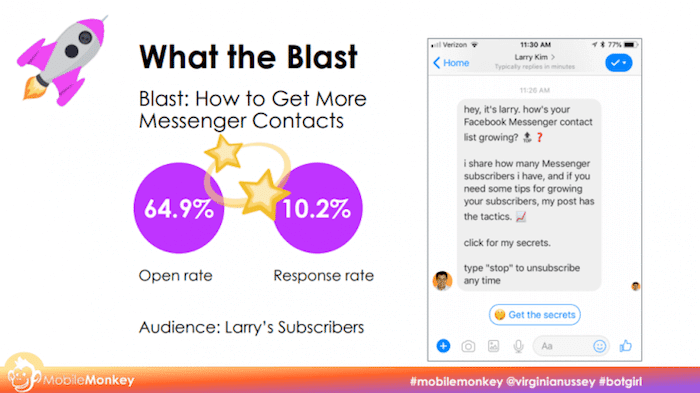 If you use a tool like MobileMonkey, for example, you can “blast all your contacts directly on Facebook Messenger, so you don’t have to worry about the News Feed filters,” according to Larry Kim. Facebook Messenger messages convert 3x to 5x better compared to Facebook desktop ads. This is because most Messenger users are on mobile and more frequently engage with messages. Facebook desktop ads have to share a large screen with tons of other ads and content. And it doesn’t hurt that people think messaging is the second-best way to talk to a business. Facebook Messenger messages can reduce your marketing costs. For example, here’s an interesting case study describing how MobileMonkey cut the cost of lead acquisition from $150 to $5 per lead using Facebook Messenger. According to MobileMonkey’s Larry Kim, “we’re finding that the new Facebook Send To Messenger Ads can generate leads at 30-50x less than what you’d pay for the usual Facebook ad campaigns.” Similarly, chatbots have helped other brands increase conversions. Sephora’s reservation assistant increased the average user spend to $50, while Tommy Hilfiger’s chatbot increased returning customers by 87%. Facebook Messenger can segment your audience. You can segment your audience on what they prefer or do and then target different chat blasts to different segments of your audience. You can create smart chatbots to automate Q&A with a live takeover by a human. For example, if you want to invite people to schedule a sales call with your team, you can automate a Facebook Messenger chatbot to ask for the necessary contact information. And, importantly, a human can jump into any conversation and take over at any time. You don’t need to know how to code to launch a Facebook Messenger chatbot. Anyone can use easy to use tools from a company like MobileMonkey to create chatbots in minutes without any help from software developers. Bots can, among other tasks, help book sales appointments, track delivery, or make product suggestions. Bots can also help book a flight or order dinner, remind you to purchase a product, notify you about an offer you might like, or tell you a joke. For example, Sephora’s bot eliminates five steps from booking a makeover in one of their stores. Sephora’s bot increased the booking rate by 11 percent. Whole Foods’ bot helps people discover recipes based on ingredients. Here are more great examples of popular bots. To learn more about using chatbots, we recommend you read How Chatbots Can Help You Grow Revenue In Your Business. Add a Facebook Messenger button on your website and on your Facebook page. A button on your site or Facebook page will let your customers and prospects connect with your chatbots with a simple click. Facebook gives you appropriate embed codes for your landing page or you can use plugins if your site is running on a CMS (content management system) like WordPress. A landing page is a simple, targeted web page that steers your visitors to one specific goal. Landing pages can collect leads, motivate downloads and/or generate sales. For a new business, landing pages can establish credibility, create excitement for your new product or service, and collect leads for future customers – all before you officially launch. We recommend you read Give Your New Business a Jump Start with an Effective Landing Page and How to Create a High Converting Landing Page to learn more about creating great landing pages. If you use a tool like MobileMonkey, you can quickly build landing pages for your chatbots without any coding. Obviously, you want to offer people something of val ue as you build that list. You don’t want to simply sell 100% of the time. One good way to do this is by sharing your most valuable content developed on your blog or other social networks, through Facebook Messenger blasts. What’s your most valuable content? Here’s a terrific post that will help you identify your content marketing unicorns (content that will perform in the top 1 percent). Once you identify your most valuable content, use paid Messenger ads to share it. Messenger ads are rare on Facebook. These ads direct users to message your Facebook Page. Once users get to your Facebook page, you can have your Facebook Messenger chatbot respond instantly to your Messenger ad, matching the message, offer, and audience. If you want to learn more about Messenger Ads, we recommend you read: What Are Messenger Ads? Everything You Need To Know About Click-to-Messenger Facebook Ads. Link to your Facebook Messenger chatbot from email signatures. You can include a link to your Messenger chatbot in your email signature, or if you use a support service like Zendesk or Helpdesk, from the signatures your support agents use. Facebook’s Discover Tab is a collection of Messenger bots and nearby places and businesses to message. You’ll need to fill out a submission form but it’s simple and will help you gain more visibility with Facebook users. To get your chatbot listed in the Messenger Discovery tab on Facebook, you have to fill out a submission form. 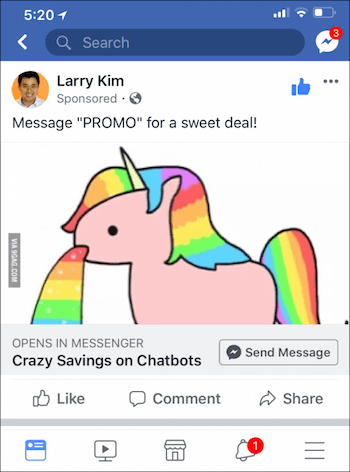 Larry Kim has developed a 9-point guide to help marketers and business owners become a master at Facebook Messenger chatbot marketing. You can find the complete chat blasting guide on MobileMonkey’s blog. Below, we briefly summarize each of the nine suggestions. Facebook Messenger has several types of messages. Standard messaging allows you to send any type of message (promotional or non=promotional) to a person, within 24 hours, after they send your chatbot a message. You can send as many messages as you want within a 24 hours period. After the first 24 hours, you can send only one additional message to that person. Subscription messaging allows you to chat blast non-promotional messages as often as you want. You must apply to Facebook for subscription messaging status for each Page. This takes about 10 minutes of your time. Once you’re approved for subscription messaging, you need to build your subscriber list. 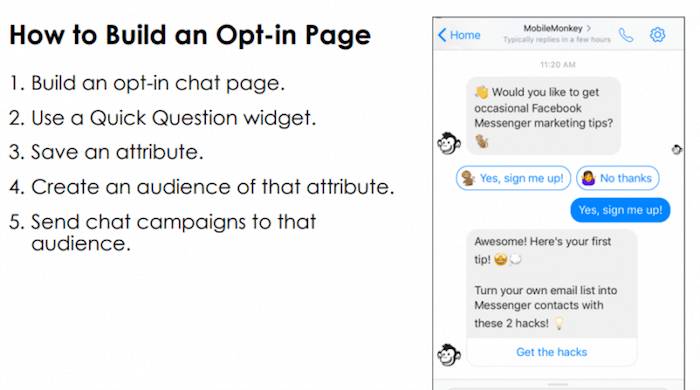 Start by building a Messenger opt-in page. Below is an example of MobileMonkey’s opt-in page. Since you’re allowing people to subscribe, you also must allow them to easily and quickly unsubscribe. If you use a chatbot tool like MobileMonkey, this is easy because they handle all the technical stuff. People can simply unsubscribe by typing “stop” in response to any message. You can grow your subscriber list by running click-to-Messenger ads targeting your Page fans, build a Facebook Post autoresponder to engage commenters when they leave a comment in Messenger conversations, and update your Facebook Page CTA to “Send Message” to your Messenger chatbot. And don’t worry – you can easily comply with the EU’s GDPR regulations by following these best practices. People are different and generally, have different interests. You can easily segment your Facebook Messenger contacts into custom audiences, and then vary your messages to each audience segment. Facebook advises that marketers use short messages and if they’re sending longer messages, to separate them into a series of shorter messages. After all, people are mostly seeing these messages on a small mobile screen. Facebook also recommends you add color. This is where your company’s logo or icon would help you get attention. Your brand identity is important so be sure to make it clear and apparent. Notice the MobileMonkey icon in the example above. And be sure to use your business name in your messages. After all, there’s no point to communicate with people about your brand if they don’t know with whom they’re communicating. Combine any widgets you use in your messages with a strong CTA (call-to-action). Here’s a good example from a recent Messenger blast Larry Kim send to his subscribers. (Kim is a top contributor to CNBC, Inc. Magazine and is the #8 ranked author on Medium. You can connect with him on Facebook Messenger). CTA’s are important, not just for messages but also on your website. For more on CTA’s we recommend you read: Grow Your Small Business With These 7 Website Design Best Practices. Also, be sure to use the right voice for your messages. Messenger is typically used to talk with friends. Since this is a unique channel, talk like you would with a friend. If you normally would use emojis, use them in your messages. Be sure that your brand voice in messages is consistent with your brand, but do account for the differences in channels. Normally, personalizing many messages when you’re blasting them to a large audience can be time-consuming. But if you use a tool like MobileMonkey, you can use dynamic parameters to include a person’s first name just like you would in an email. You can also include custom variables that you create in MobileMonkey. Custom variables are bits of info that you gather over time which you can use to personalize your responses and messages. As you start experimenting with Facebook Messenger blasts, you’re bound to make some mistakes. But don’t worry, even the best experts make chat blast mistakes. For example, don’t forget to include unsubscribe language in every chat blast. Otherwise, people will block you or complain to Facebook. Also, be sure to test your messages on small sample sizes and send only your best-performing messages to larger groups. You can create sponsored messages to promote your brand’s products or services. This allows you to use all of Facebook Ads targeting abilities on top of your own list of contacts, and go beyond your organic reach. And you can send a message at any time and overcome the restrictions with other types of messages. You can create sponsored messages in Facebook Ads Manager, but instead of the Click to Messenger option, click the Sponsored Messages as your Messages destination. As with other marketing campaigns, you must measure each campaign to see if it’s effective. 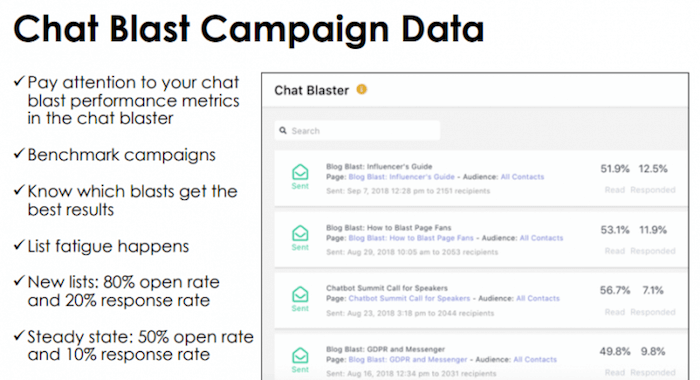 You can check Facebook Insights or, if you’re using a tool like MobileMonkey, you can look in MobileMonkey’s chat blaster for message analytics. To learn more about using the Messenger chatbot effectively, watch this free one hour webinar. Now that you know all about Facebook Messenger marketing, it’s time for you to take the next step and set up your first bot. It just might be the fuel you need to supercharge your marketing.